On Jan. 26, 2014, a magnitude 6.0 earthquake struck the island of Cephalonia, Greece, followed by a magnitude 5.9 event on Feb. 3, 2014. The combined events caused extensive structural damages and widespread environmental effects. The region where this earthquake took place is a plate boundary region, and better understanding of the complex tectonics can help take appropriate prevention measures, as improvements of the seismic classification to reduce the impact of future events. Following the first earthquake, the Committee on Earth Observation Satellites (CEOS) coordinated acquisitions of satellite imagery from the Italian Space Agency’s (ASI) COSMO-SkyMed satellites and the German Space Agency’s (DLR) TanDEM-X satellite. These data enabled researchers at the Italian National Geophysics and Volcanology Institute (INGV) and at the National Observatory of Athens (NOA) to measure the 3D permanent co-seismic deformation field of the Feb. 3, 2014 event by applying a combination of three processing techniques, namely: Differential Synthetic Aperture Radar Interferometry (DInSAR), Intensity cross-correlation, and Spectral Diversity (a.k.a. Multi Aperture Interferometry). 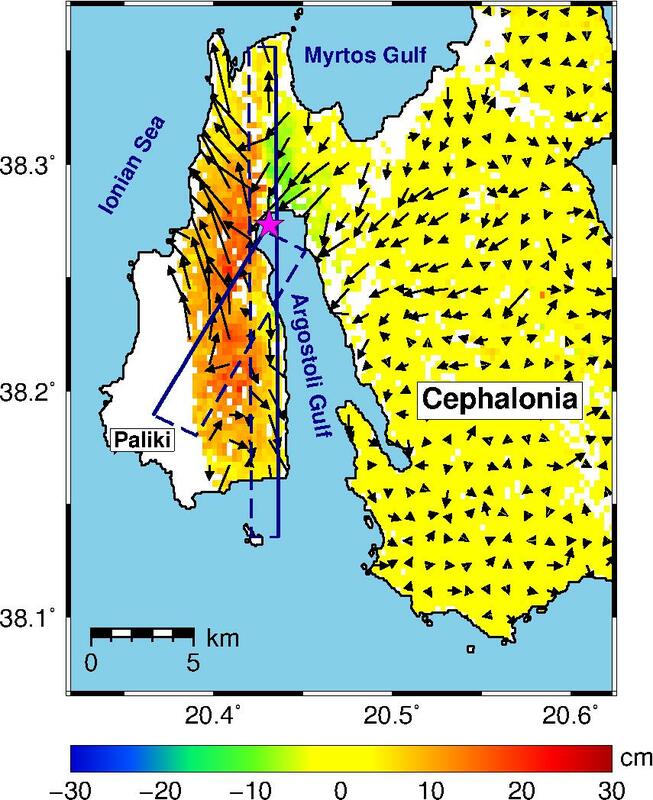 The results show that the fault rupture causing the earthquake also generated a displacement of the ground over a wide area, with diffuse surface motions reaching as much as 35 cm in the north-south direction, as well as a relative uplift of about 20 cm of the whole Paliki peninsula with respect to the rest of the island. The incredible details offered by satellite data allow researchers to accurately map the effect of specific events and better understand the tectonics of complex and dynamic regions. In this case, the results of the analysis indicated that fault ruptures with a main horizontal right-lateral mechanism and a reverse component can also occur onshore in Cephalonia, not only off its western coast as was previously believed. Learn more about the activities of the CEOS Working Group on Disasters.